Today my hero died. This is not a euphemism, he really was my hero. He showed me on many occasion that actions define your place in the world. We lived together for 17 years. Making our way through life, mostly doing our own thing. At times having to cope with the wishes or limitations from others. He taught me that activism is a way of life: if you decide upon an action, you go for it full-heartedly (he thought he was a black panther). He explored every new environment with care, yet a great determination to find every crevice, nook and cranny (compared to him Dr. Livingstone was a softie, though he would never tell anything bad about anyone). He protected his family: saving me from many spiders, sweeping them from the walls, floors and any surface he could reach (I do not want to kill spiders, but am scared of them nevertheless). His agility even let him pick bats out of the sky (though he did not find them very tasty and he did not understand why I incessantly tried to save them). He showed me that any movement should always be graceful (what grace! ), that being polite is easy and comes natural (coming home was always noticed by a friendly welcoming message), and that any action undertaken should be brave (even if you are small, looking big will give you a head start). In his last year, he even taught my one year old son how to walk tall and with flair. They would walk side by side, prancing around. 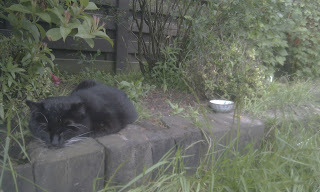 He would have told him how to catch a mouse, climb trees, climb the garden fence ... explore the world. But death got to him first ... and part of my heart broke. How strange it is to feel physical pain, where I thought I would cope more easily with loosing a 17 year old, brave furry friend. I watched over him during his last night (he cried every time we (my partner and I) left him alone on the couch, so it was natural to stay with him during his last moments on this blue planet.. I picked him out of a bunch of small kittens, based on him being the one leaping into action: jumping from refrigerators (8 weeks old), determined to explore, and all the while talking loud and proud (he was one quarter Siamese which every veterinarian guessed immediately based on his amazing drive to talk). In his lifetime he lost an eye during a street cat alley battle. After a few hard weeks he simply learned how to jump and move around basing his movements on his newly found perspective (sulking would only keep him from new experiences, so moving on was a normal way of life). He lifted my spirit, he was a companion during a couple of divorces, several professional challenges, hard times and - oh lucky us - wonderful, glorious, happy times. I miss my hero. His voice, his warm body on my lap, his insistence to come outside to play, his winking eye, his companionship... I miss you Schiele. I wanted you by my side for the rest of my life, my dear old friend. With mobile gaming getting more and more attention in education as well, this conference seems a good immersion for serious gaming. At the upcoming 2nd Annual Serious Play Conference, some of the top thinkers in serious games will be brought together to discuss big questions facing the use of non-entertainment games and sims. The conference organizers also address different gaming subheadings. In case of education they write: "games for Learning sessions at Serious Play will be designed to help school administrators and instructors as well as companies offering at home learning product determine how to best choose or contract for serious games that deliver learning objectives and measurable results. Professors of game development programs will get the tools to help students begin a serious game career". That sure looks promising. There will be speakers from IBM, Microsoft and UCLA and lots of other leading game developers and visionairs. Cost: early bird 3 day pass: 500 $. More than 50 of the top thinkers in serious games will come together to discuss the future of the use of non-entertainment games and sims, Tuesday – Thursday, August 21 – 23, 2012 at the 2nd Annual Serious Play Conference at DigiPen Institute of Technology in Redmond, Wash.
An Early Bird Discount is still in effect as well as special faculty and student pricing. Since March 2011 I am a diabetic type 1. This means that my pancreas is no longer functioning and I have to take 4 insuline shots per day (Novorapid and Lantus (glargine)). 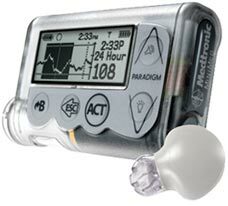 In the past 6 month I have bought a Continued Glucose Monitor (CGM) produced by Medtronic. The CGM enables me to keep an almost real-time overview of the glucose in my blood. This is great for me, as I have a various activities (so glucose use varies) and I have a small child (now 1 year old) which makes me more aware of my child his safety. I use the CGM without an insulin pump, so I just use the monitor to keep me informed on possible hypoglycemics (low blood sugar with a risk of getting in coma when too low). The CGM is currently sending glucose information to a Medtronic monitor, but it would be an improvement if it would send information to a smartphone (BYOD type of development). Security might be an issue, but the CGM monitor has been hacked also, so well. Getting your blood sample info to an iPhone is already possible (see movie below), so getting CGM info to my/any smartphone is feasible. Now add to this a carbohydrate smart scale that is connected to my smartphone or other mobile device (e.g. the wireless scale in combination with iPad/iPhone). This does require a scale that has options to choose from: buttons for different carbohydrate foods and fruits to allow the scale to immediately convert the weight into the right amount of carbohydrates. This way, the mobile device can calculate the amount of insulin you will need and add the meal information to a offline/online synchronized personal database. When the CGM sends encrypted information to a smartphone as mentioned above, additional health applications can be build. For instance one that keeps you up to date on how your glucose is changing throughout the day in relation to your food intake. For instance, which foods allow you to do a more strenuous workout, or are better at keeping your glucose stable when doing nothing (airplane, daylong meeting,etc). For this an algorithm must be build that monitors different variables and can indicate what type of food gave good results overtime (in my case brown pasta is always giving me problems, so I would love to know if it is linked to anything else). Of course there are many diabetes related apps out there already: Android based, iPhone based, other, or check out this one EndoGoddess which seems to give points for putting in your diabetes info an in exchange you can download iTunes music - interesting business support model. But these apps miss the personalized, more semantic type of algorithm. Add to this a training application to inform diabetic newbies: YouTube movies, cause and effect information, food advice, workout advice (e.g. eating olives and avocado's helps in increasing good cholesterol levels because they influence the take in of bad cholesterol in favor of the good one). And finally, provide a newsletter URL or RSS feed that is mobile enabled. It is easy and promotes all that deliver information, so win-win situation. So how would this improve my mobile diabetic life? It saves time in putting the information of weighing food into any paper notebook or smartphone app, because the scale is connected to the smartphone. It saves time in calculating, as the smartphone can immediately calculate how much insuline you need for the amount of carbohydrates you have weight in relationship to the time of day. And it saves quality time as I learn continuously (or when I am willing). So if any of you Medtronic managers/developers would be interested, I will gladly share my ideas/tech knowledge to get this realized (no fee, just fly me to your headquarters and let the meeting begin). For sure Medtronic is amazing at leading research to a fully closed, artificial pancreas. See for instance their latest news on the path towards an artificial pancreas in their newsroom article here. Thanks to Domingo Liotta I am also a bit at ease about my night insulin that is glargine (which has said to increase the cancer risk), but now three new study is out indicating that glargine would not increase the cancer risk (let's hope so, for long-term studies are still running). And last but not least the linkup between blood level updates and iPhone. When setting up a mobile learning course, it is not always easy to get everyone on the same page. There are a lot of factors that can vary from learner to learner. Nevertheless, any learning will benefit from a strong learning community that feels connected to each other. 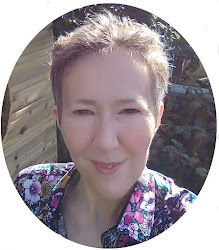 So I went through my mobile strategy notes and filtered out 5 ways that I have been using to grow the community spirit of a new mLearning group at the beginning of a course. Feel free to share yours, I feel that there are much more ideas out there. In my case the mobile courses are mostly developed for people already having a personal, mobile learning device (smartphone, tablet, internet enabled cell-phone...) and using them to access the course (BYOD). This pushes me to combine community activities that also increase mobile skills. BUT before asking newbies to get their mobile devices out and use them, I always stress the importance of WiFi for financial reasons. Ask learners to take a picture/record a movie (e.g. Qik) of a famous landmark of their own country/region, or their front door (easy and fun) and load it to a central location via e-mail (I would recommend Posterous for this, easy and quick). Asking learners to share their wildest mLearning dreams (a good way to stretch the possibilities and let them know the scope and opportunities of mLearning). Ask them to share the URL of their mobile learning device details (this gets learners interested in the details of their own mobile device, it is techy, but will get them aware of the tech details and on how to choose future mobiles. A great step towards a general mobile device tech session: wifi, pixels, bluetooth...). 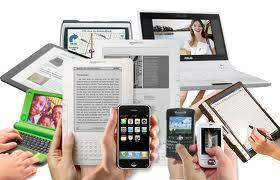 This will also allow you to get some idea of the variety and most common mobile devices for your course. The architecture of this course will follow the (peace) tree architecture. 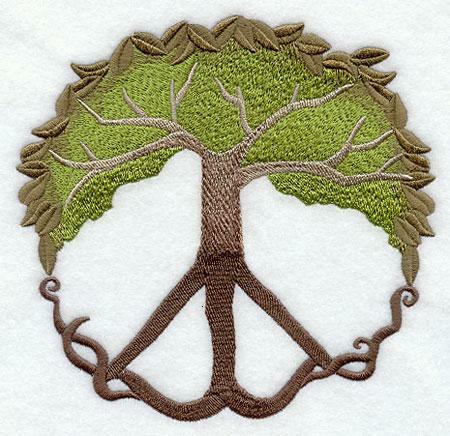 What is meant by the (peace) tree architecture? A tree architecture is a course format that provides 1 topic in the first week, three in the second and more (six) in the third or later weeks. A bit like the branches of a tree, where there is a central stem (= mLearning) and different branches emerge into thinner, more specialized topics. This course architecture was chosen to allow people with different backgrounds to first get on the same basic level and to get all of us comfortable during the first week. The topics of the second week are a bit more complex, yet they add to already existing learning experiences or more holistic mLearning views. In the third week, or specialized week, more complex topics are given in parallel with each other, enabling all of us to choose the topic that is of interest. The idea of the name came to me because I truly belief in the tree of life peace symbol. And I hope that open education and critical thinking will move all of us towards a more humane, peaceful world. All the topic content will be shared via Open Educational Resources (synchronous sessions will be recorded and shared, resources will be bookmarked and shared...) to add to the idea of free education. Closing date of the course: 30 September 2012 – with special surprise. So, if you are interested in mobile learning (mLearning) in a variety of aspects, feel free to join MobiMOOC2012. Location of the course: online, the course uses many social spaces, but there are 2 core spaces the course wiki and the MobiMOOC Google group (we might move to a discussion forum due to Google groups fading out, but this is our gathering point). 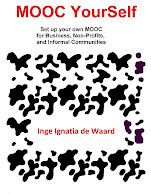 How to register for the course: simply request membership for the MobiMOOC2012 group. Feel free to send this through to anyone you might think has an interest in mLearning. 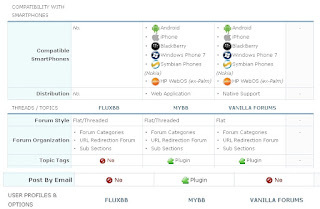 Searching a #discussion forum that is #mobile friendly #MyBB? In setting up MobiMOOC, I recently realized Google is fading out Google groups. Or at least it certainly feels that way. So I want to find a new tool that is optimized for discussing content and ideas in a user-friendly, social media enabled and transparent way. MobiMOOC will focus on mLearning, as such I need to find a discussion forum software that is accessible to smartphones (at least) and has an e-mail upload function (this also allows learners to add content to the discussion forum with their wap enabled or simple internet connected cell-phones). At the same time I want the discussion forum to be social media minded (as a lot of social media is used during MobiMOOC). After comparing several discussion forums on the forum software compare URL, I think I will go for MyBB. If anyone has experience with MyBB, feel free to connect. Everyone is joining mLearning, but in many cases some of the basic steps are missing. Looking at my own mLearning roll out, I now see much more elements that will support a good and strong adaption and roll out of any mobile project. 1. What is the goal of the mLearning project? Is it to develop a course? Is it to get knowledge disseminated? Is it to get your experiences shared with others in your learning network? The goal of a project must be made as clear as possible before setting up anything else, as the goal will shape what you will need and how you can built it most effectively to reach that goal. Participation and support by all is essential for any learning to take place. With relevant stakeholder representatives chances increase that the learning environment that is build will be accepted by the majority and as such will be used. All stakeholders must feel comfortable with the new training project, otherwise you risk one group dropping out. The earlier you get feedback from all stakeholder groups, the more tailored the learning environment can be. Peer-to-peer – e.g. engineers or tech students jotting down quick repairs they did for particular cases and sharing those solutions, while also providing feedback on others, or one-to-many: the specialist or expert sharing her/his ideas with others to get them up to speed on new innovations, knowledge, changes…. The learner dynamics will have a profound impact on the overall design of the learning environment or course architecture and the tools you will use to design the learning environment. 4. What is the (mobile) infrastructure like in the target area you will be rolling out your project? If you will work in a rural area with scattered mobile coverage (mountainous area, desert…) , you need to take a wiki hotspot into consideration to disseminate learning content. If you are working in a well-covered mobile area, you might still have problems with electricity (certain areas of Africa) which has an effect on the solutions you will provide for the learners (solar panels, rechargeable battery set). 5. What is the mobile situation for your target audience? Do all of them have a mobile device? Are they familiar with the more advanced options on their mobile devices? What is the payment plan for accessing mobile internet/sms/mms… What is their financial situation? Knowing all of these criteria will allow you to provide mobile solutions that are in synch with the possibilities and experiences of your target audience. 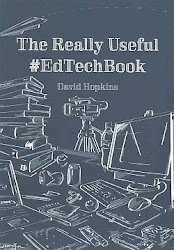 Not adding too much new tech stuff will provide a more balanced, less frightening learning environment for any target audience (well, except geeks, they love tech challenges for the most part). What is the security you need to deliver your mLearning content or design your mLearning project? This will affect your design in open (Cloud) or closed (behind firewalls, more secluded…). It also affects the devices that will be designed for. Because the more devices you want to address, the more difficult it will be to keep a secure overview and develop/deliver secure content. 7. What will be the core devices you will cater for? BYOD or not? Depending on the security options you can opt for one type of mobile device, or you can go for the concept of Bring Your Own Device (BYOD), which is all the rave right now. But if you opt for BYOD it results in a more complex, yet at the same time more standardized set of options to deliver your mLearning content. 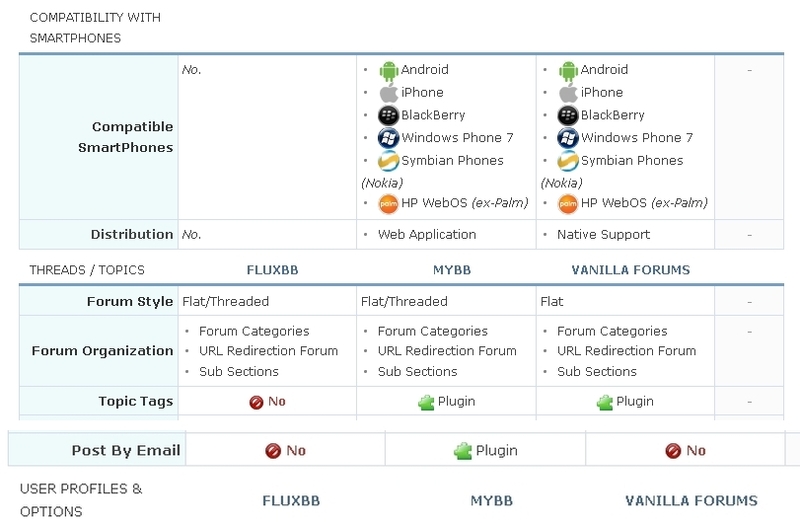 Choosing one type of mobile device will allow you to search for just one authoring tool or content building option. If you choose for BYOD, you might want to consider some programming, or at least design your content following html5/CSS (a free course can be found at W3C making sure you get the standards of html5 right from the start). If you will not work with multimedia files, simple html/CSS will do also, keep it as simple as possible. Yes, KISS. 8. How will you design the content? Authoring tools or programming or social media? Knowing the devices you will be catering for, you can now tackle the design. You can go for available authoring tools that deliver both mobile and web-based content, or you can opt for programming (either in different mobile programming languages or delivering content that is designed via SDK (Software Development Kits) that are made available for a variety of mobile device types. If you use peer-to-peer content, you will need to allow your learners to create content that can be shared. In that case it is worthwhile to consider social media locations for your content spaces. Most of the social media tools offer mobile options and they are made specifically for sharing/writing content as well. Make sure you have a strategy for the content delivery. Will content be delivered via wifi downloads (only downloadable via wifi), will it be delivered via mobile internet download (in that case make the content bite size, otherwise it will take forever to download and … it will cost a fortune). If you are setting up peer-to-peer course parts, it is important to make communication as easy as possible. For example you can use e-mail access to communicate via discussion boards or tweet updates. 10. What is a mLearning content user allowed to do? Guidelines for the users are always important to keep everyone happy. Make sure you provide clear guidelines for the content you provide. How can they communicate with each other (or with the facilitator/teacher/trainer). Can they deliver the content to other people (is there an intellectual copyright?). Can they provide their access codes to others? Can they remix the content and use it in their own courses? How must your learners add content to the course (if they are requested to do so): in writing, pictures, movies… and how must this content be delivered? This is what I come up with, but feel free to add any ideas or strategies you use to optimize your mLearning project. Collaboration is always more fun, and rewarding. The wonderful Ralf Klamma (@klamma) got me onto just the thing I needed for today: building my own widgets workshop! If you plan to be in Portugal or there abouts in mid July, you might want to check out a workshop on creating widgets. The ROLE SDK workshop on widgets will be given during the PLE conference in Alveiro Portugal from 11 - 13 July 2012. Widgets are great for they can give a content overview in just a minimal space. I love to use them to build what I call course dashboards. One page overviews that cover a diversity of online tools via widgets that show the headlines or titles of what is going on in each of these learning spaces. In the last year the ROLE project developer team has bundled a set of technologies developed within the project such as learning spaces, local and remote inter-widget communication, tracking and access to learner interaction data, recommendation, etc. into one reference implementation, which is deployed and publicly available as the ROLE Software Development Kit (SDK). ROLE has just entered the fourth project year, where our main endeavour is to test the already operating learning environment and widgets. You are invited to follow us on facebook, twitter, linkedin or youtube. To give you an idea on how widgets are build, take a look at the presentation that was given during dev8ed in Birmingham.